View of Falkland Palace from the lawn. 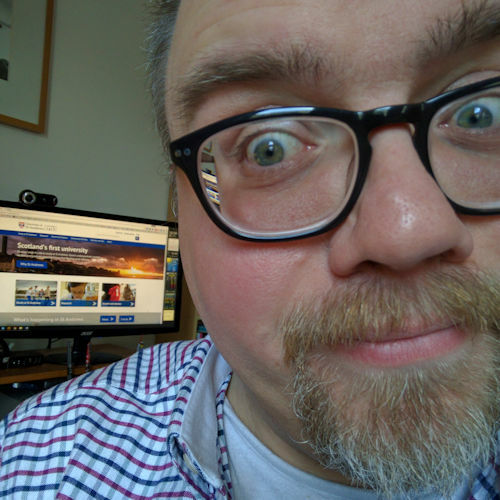 Ask me how I’d like to spend a Sunday afternoon and I’d probably not even think of including “watch an international folk dance festival in the grounds of an ancient Scottish palace”, but that’s exactly what Jane and I did a couple of days ago. When we got there, however, we discovered that we weren’t the only people to have decided to visit Falkland Palace that day. The town was buzzing with visitors, tour buses were double-parked on every corner decanting colourful people wearing Scottish, Czech, Austrian and Lithuanian national costumes. 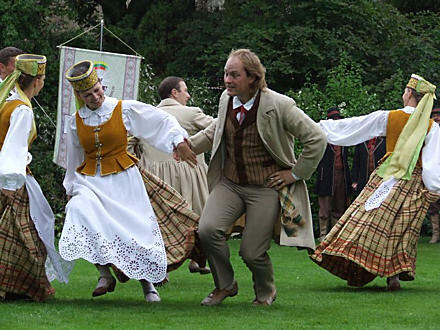 It turned out that the Dunedin Dancers‘ 19th International Folk Dance Festival was being held in the palace grounds. So after a spot of lunch in the palace gardens, and a look at the Royal Tennis court, we settled down to watch the dancing. Indeed! That would just be musical statues, and I’m not sure that the 19th International Folk Musical Statues Festival would hold the same attraction for people. I have to say — as metal as I am — it was all very impressive indeed. I was particularly impressed with Rasa, a folk dance group from Lithuania, and not least because the young women appeared to be dressed in a cloth not dissimilar to Burberry, and the young men all looked like Colin Baker-era Dr Whos! The children were getting a little restless and we had tickets to visit the palace too, so we managed to stay only for the Scottish and Lithuanian dances, leaving just as the Austrian dancers came on. We caught only a glimpse of the Czech dancers from a vantage point on the Palace battlements. 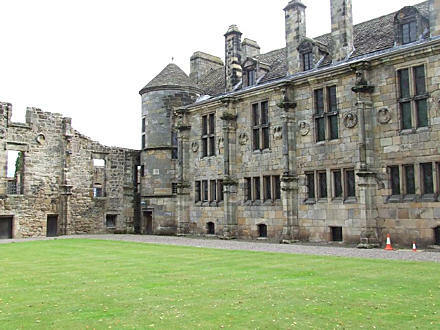 Check out more photos on my Flickr Falkland Palace set.